Prof: Cannot afford to ignore English. TANJUNG ARU: Having a good command of the English is one of the pre-requisites for entry to universities. Universiti Tun Abdul Razak (Unitar) Adjunct Professor, Prof Dr. Mornie Kambrie said on 17 November 2009, English is widely used in Unitar, among others. According to him, the best students in Malaysia always have dictionaries with them. When asked how many of them brought dictionaries with them, not a hand was raised. About 100 students from more than 120 secondary schools and from as far as Tambunan and Keningau attended the one – day seminar held at Dewan Puspa Seri Faridah, Wisma Puspanita here. Offering tips, Prof. Dr. Mornie advised the students to read English books and newspapers and watch English programmes on TV such as Discovery Channel. He said the participants were very lucky to participate in the seminar and hoped they would play a role in leading their peers out there. All students were also advised to stop using the Short Messaging Service (SMS) language in class. “Unfortunately, the SMS language is going into the classroom. When writing English essays, students are using short forms. Please do away with this practice… it is not going to help you improve your English.” Prof Dr Mornie pointed out. The one day seminar was organised by Puspanita State Branch Counselling Sub-Committee with the co-operation of the State Public sector Training Institute (insan) under the Chief Minister’s Department. The seminar was officiated by Director of Insan, Encik Sa’adilah Hj Abdillah. Also present were Puspanita state Branch Chairperson, Datin Hairani Hussaini, Counselling Sub-Committee Chairperson, Datuk Noni J. Said, Insan Principal Assistant Director, Dr. Chacho Hj Bulah, Insan Senior Director, Puan Faridah Malai, QEH Principal Assistant Director (Health Promotion Unit), Encik Abdul Razak Md. Noh and Human Resource Development Department’s Training Officer, Puan Tianinum Iping. Both Prof Dr Mornie and Noni also drummed home the importance of maintaining toilet cleanliness at all times whether they (students) are in school or public buildings. “The habits of cleanliness must start from you as agents of change. Love your environment too. Protecting your environment is one of the marks of a civilised person.” he said. Speaking at the closing ceremony, Noni said she had discussed with Prof. Dr. Mornie the possibility of grooming a group of potential leaders to be selected from the 100 seminar participants. She rated the students’ level of teamwork as excellent, particularly during the workshop, group discussion and presentation. She gave away certificates to the facilitators and participants while Prof Dr. Mornie presented prizes to the three best participants. They were Meme Marnie Matin, 16, a Form Four students of SM Agama Toh Puan Hjh Rahmah, Sembulan; Nurlynafarihah Daya, 16, a Form Four student of Maktab Sabah and Dayangku Nadhirah Awang Hamidun, 14 , a Form Two student of SMK Putatan. Everyday interruptions at work can be a key barrier to managing your time effectively and, ultimately, a barrier to your success. Think back to your workday yesterday and consider for a minute the many interruptions that occurred. They may have been phone calls, emails, hallway conversations, colleagues stopping by your office, or anything else that unexpectedly demanded your attention and, in doing so, distracted you from the task at-hand. Because your day only has so many hours in it, a handful of even the smallest interruptions can rob you of the time you need to achieve your goals and be successful in your work and life. More than this, they can break your focus, meaning that you have to spend time re-engaging with the thought processes needed to successfully complete complex work. The key to controlling interruptions is to know what they are and whether they are necessary, and to plan for them in your daily schedule when they truly need your attention. “A picture is worth a thousand words.” This is certainly true when you’re presenting and explaining data. You can provide tables setting out the figures, and you can talk about numbers, percentages, and relationships forever. However, the chances are that your point will be lost if you rely on these alone. Put up a graph or a chart, and suddenly everything you’re saying makes sense! Graphs or charts help people understand data quickly. Whether you want to make a comparison, show a relationship, or highlight a trend, they help your audience “see” what you are talking about. The trouble is there are so many different types of charts and graphs that it’s difficult to know which one to choose. Click on the chart option in your spreadsheet program and you’re presented with many styles. They all look smart, but which one is appropriate for the data you’ve collected? Can you use a bar graph to show a trend? Is a line graph appropriate for sales data? When do you use a pie chart? The spreadsheet will chart anything you tell it to, whether the end result makes sense or not. It just takes its orders and executes them! First we’ll start with some basics. To create most charts or graphs, excluding pie charts, you typically use data that is plotted in two dimensions, as shown in Figure 1. The horizontal dimension is the x-axis. The vertical dimension is the y-axis. Tip: To remember which axis is which, think of the x-axis as going along the corridor and the y-axis as going up the stairs. The letter “a” comes before “u” in the alphabet just as “x” comes before “y”. The next issue you face is deciding what type of graph to use. One of the most common graphs you will encounter is a line graph. 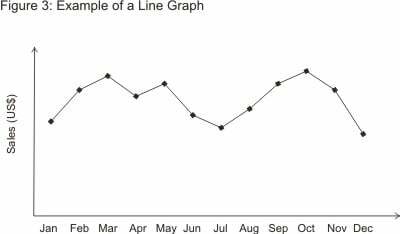 Line graphs simply use a line to connect the data points that you plot. They are most useful for showing trends, and for identifying whether two variables relate to (or “correlate with”) one another. How do sales vary from month to month? How does engine performance change as its temperature increases? On average, how much sleep do people get, based on their age? Does the distance a child lives from school affect how frequently he or she is late? You can only use line graphs when the variable plotted along the x-axis is continuous – for example, time, temperature or distance. 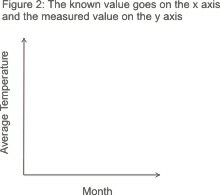 When the y-axis indicates a quantity or percent and the x-axis represents units of time, the line graph is often referred to as a time series graph. ABC Enterprises’ sales vary throughout the year. By plotting sales figures on a line graph, as shown in Figure 3 , it’s easy to see the main fluctuations during the course of a year. Here, sales drop off during the summer months, and around New Year. While some seasonal variation may be unavoidable in the line of business ABC Enterprises is in, it may be possible to boost cash flows during the low periods through marketing activity and special offers. 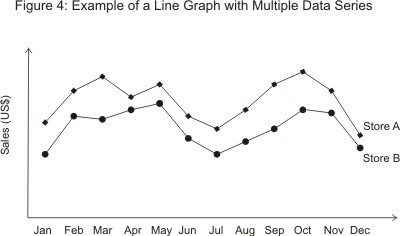 Line graphs can also depict multiple series. In this example you might have different trend lines for different product categories or store locations, as shown in Figure 4 below. It’s easy to compare trends when they’re represented on the same graph. 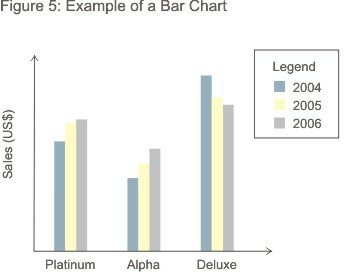 Another type of graph that shows relationships between different data series is the bar graph. Here the height of the bar represents the measured value or frequency: The higher or longer the bar, the greater the value. ABC Enterprises sells three different models of its main product, the Alpha, the Platinum, and the Deluxe. By plotting the sales each model over a three year period, it becomes easy to see trends that might be masked by a simple analysis of the figures themselves. 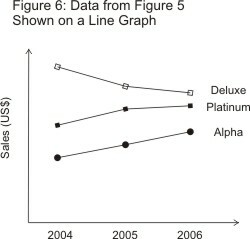 In Figure 5, you can see that, although the Deluxe is the highest-selling of the three, its sales have dropped off over the three year period, while sales of the other two have continued to grow. Perhaps the Deluxe is becoming outdated and needs to be replaced with a new model? Or perhaps it’s suffering from stiffer competition than the other two? Of course, you could also represent this data on a multiple series line graph as shown in Figure 6. Often the choice comes down to how easy the trend is to spot. In this example the line graph actually works better than the bar graph, but this might not be the case if the chart had to show data for 20 models rather than just three. It’s worth noting, though, that if you can use a line graph for your data you can often use a bar graph just as well. The opposite is not always true. 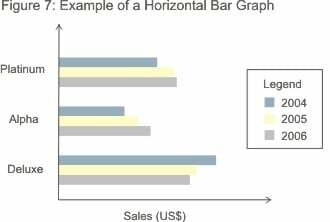 When your x-axis variables represent discontinuous data (such as different products or sales territories), you can only use a bar graph. In general, line graphs are used to demonstrate data that is related on a continuous scale, whereas bar graphs are used to demonstrate discontinuous data. Data can also be represented on a horizontal bar graph as shown in Figure 7. This is often the preferred method when you need more room to describe the measured variable. 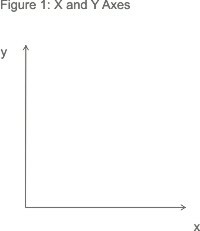 It can be written on the side of the graph rather than squashed underneath the x-axis. A bar graph is not the same as a histogram. On a histogram, the width of the bar varies according to the range of the x-axis variable (for example, 0-2, 3-10, 11-20, 20-40 and so on) and the area of the column indicates the frequency of the data. With a bar graph, it is only the height of the bar that matters. A pie chart compares parts to a whole. As such it shows a percentage distribution. The entire pie represents the total data set and each segment of the pie is a particular category within the whole. So, to use a pie chart, the data you are measuring must depict a ratio or percentage relationship. You must always use the same unit of measure within a pie chart. Otherwise your numbers will mean nothing. 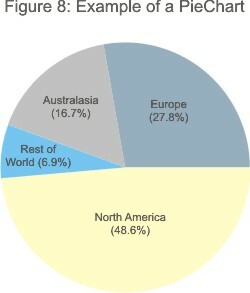 The pie chart in Figure 8 shows where ABC Enterprise’s sales come from. The last graph we will cover here is the Venn diagram. Devised by the mathematician John Venn in 1881, this is a diagram used to show overlaps between sets of data. Each set is represented by a circle. The degree of overlap between the sets is depicted by the overlap between circles. 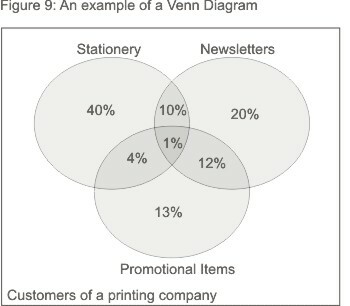 Figure 9 shows sales at Perfect Printing. There are three product lines: stationery printing, newsletter printing, and customised promotional items such as mugs. By separating out the proportions of the business’ customers that buy each type of product, it becomes clear that the majority of the biggest group of customers (55% of the total) – those who have their company stationery printed – are only using Perfect Printing for stationery. It’s possible that they don’t realise that Perfect Printing could also print their company newsletters and promotional items. As a result, Perfect Printing should consider designing some marketing activity to promote these product lines to its stationery customers. Customers who get their newsletters printed by Perfect Printing, on the other hand, seem to be well aware that the company also offers stationery printing and promotional items. A Venn diagram is a great choice to use when you are trying to convey the amount of commonality or difference between distinct groups. How To Raise Your Hand in Class. Do your reading assignments before you go to class. Review the previous day’s notes right before class. On the margins of your notes, write down key words that will help you locate a certain topic quickly. After you have done all the necessary reading, you should feel confident about the lecture material. Take excellent notes as your teacher lectures. Jot down key words in the margins of your notes if you have time. When the teacher asks a question, quickly locate the topic using your key words. Take a moment to breath and relax. Sort your thoughts by creating a mental outline in your head. With your writing hand, jot down a brief outline of your thoughts in response to the teacher’s question if you have time. Raise your other hand in the air. Don’t feel pressured to blurt out your answer quickly. Look or think over your outline. Answer deliberately and slowly if necessary. Don’t ever be embarrassed by your answer! If it’s partly right, you’ve done a good job. If it’s completely off-base, the teacher will probably realize that he/she needs to re-word the question. Keep trying, even if you turn red and stammer at first. You’ll find that it gets easier with experience. Kota Kinabalu: Sabah launched the State-level Environment Education Policy, Thursday, to instil environmental stewardship and a sustainable lifestyle among the people. In his speech read by Assistant Minister Datuk Ellron Alfred Angin, State Tourism, Culture and Environment Minister Datuk Masidi Manjun said the the policy is timely as various efforts and initiatives have been made to ensure environmental education transcends all levels of society. “It is my hope to see the implementation of programmes and activities on environmental education in Sabah become more coordinated, more focused with no duplication of tasks, moving towards the same mission so that the resources can be used in an optimal manner,” he said. His Ministry is taking the lead to formulate the Sabah Environmental Policy under the Tenth Malaysia Plan (10MP). The development of the policy is supported by the Japan International Cooperation Agency (JICA) under the Bornean Biodiversity and Ecosystems Conservation (BBEC) Programme. Ministry Permanent Secretary Datuk Suzannah Liaw, in her welcoming speech read by her deputy William Baya, said the Environment Education Policy outlined six strategies. “It is a huge challenge to change people’s mindset to be more environmentally friendly but I believe, if all of us persevere and have a strong cooperation, this can be achieved. I also believe that change must come from within and thus we must start from ourselves,” she said. JICA Chief Technical Adviser of the BBEC II Programme, Motohiro Hasegawa, said one of the major efforts under the BBEC Phase I was to initiate the drafting of the said policy in 2006. In January 2007, the first draft of the policy was finalised under the BBEC Phase I. The first draft of the policy was further fine-tuned with the Sabah Environmental Education Network (SEEN) members headed by the Environment Protection Department as the SEEN Secretariat under BBEC Phase II in 2008. A seminar on the implementation of the said policy was held after the launching to present the action plans of each intervention in the policy. The seminar was the beginning of the policy implementation on the ground. FIVE schools in Malaysia will soon embrace green technology and provide a new learning experience for their pupils. Under the Green Schools Campaign, these schools will be equipped with grid-connected photovoltaic systems to generate electricity. The campaign is jointly sponsored by Pusat Tenaga Malaysia (PTM) and the Association of Independent Power Producers (Penjanabebas). The initiative is also supported by the Energy, Green Technology and Water Ministry, Suruhanjaya Tenaga and the United Nations Development Program and Global Environmental Facility. The campaign will shortlist five schools that will each have a 5 kWp BIPV (Building Integrated Photovoltaic) system installed in their premises to convert solar energy into electricity. The systems will cost a total of RM750,000. According to PTM’s Malaysia Building Integrated Photovoltaic (MBIPV) project leader Ir Ahmad Hadri Haris, the total installed capacity in schools would increase from 4.4kWp to 29.4kWp once the five systems have been installed. “Each school will save an estimated 5,018 kWp/year in their electricity bill, but the campaign’s primary objective is to increase the acceptance of green energy amongst school pupils through on-the-ground awareness and education programmes,” he said. PTM last year installed the first such system at SMK Sri Aman in Petaling Jaya as a showcase project. The campaign is Penjanabebas’ flagship corporate social responsibility (CSR) project, in line with the industry’s stand on energy efficiency and sustainability. The association’s president Ahmad Jauhari Yahya described the project as an example of a successful partnership between the public and private sectors. “Our involvement in the BIPV project for schools is to turn something as abstract as green technology into something that pupils can see and monitor in order to generate interest in, and commitment to, green technology,” he added. Also present at the campaign launch were Energy, Green Technology and Water Minister Datuk Peter Chin Fah Kui, the ministry’s secretary-general Datuk Dr Halim Man, and deputy secretary-general Loo Took Gee. ENGLISH illiteracy is not just an education and social dilemma confronting most developing nations – it is a universal problem. In 1998, a study in Great Britain found that over 20% of its adult population was illiterate. A similar study in Australia revealed that almost 22% of adults, not counting any migrant person, had a major illiteracy problem. In New Zealand, over 30% of the unemployed were discovered to be virtually illiterate. In these countries, the illiteracy problem is not because of a lack of financial investment in education, nor is it linked to the quality of teaching. One of the key causes in these three highly developed countries is the inadequacy of the main methodology that has been used in schools and colleges to teach English over the last 50 to 60 years. The perception of English being difficult to learn is certainly understandable, particularly if one notes the many homophonic, multi-meaning, foreign-borrowed and silent-symbol words to be found in the language. However, while readily accepting that these factors can be a learning challenge for anyone, the contention that English is a very difficult language to master is highly contestable when its other attributes are considered. Sheridan knew that there were “rules” that applied to English but he lamented that, in his era, there was no system in place to teach them. The good news is that the key “rules” that apply to the English language have now been clarified, simplified and formalised as part of the 4S Approach To Literacy And Language accelerated learning and teaching methodology. Regrettably, few educationists are aware that just like Science and Mathematics, there are “rules” in English. These mnemonic or memory rules and clues assist learners to quickly understand the special characteristics and attributes of English that underpin personal language proficiency. In all, there are 180 rules, around 30 of which are important to know initially. They explain, in simple terminology, why words are pronounced and spelt they way they are – and also why words can mean what they mean. Unfortunately, mainly because of the use of the Whole-Word Look and Say method to teach English in most countries over recent decades, little is known by the majority of teachers about the English language. Few have even heard of the Five Influential Consonants – ‘w, r, l, q, and v’ – that can change the sound of other letters in words. For example, compare: ‘farm’ and ‘warm’, or ‘cord’ and ‘word’. Again, vital grammar skills have been lost over the years, and word creation tools – such as Skills Transfer and the Exchanging Techniques – often have never been heard of by many. Consider the 4S Key To Understanding Pronunciation, which teaches that double consonants usually split. When learners encounter the word ‘butter’, and know this pronunciation rule, not only can they pronounce butter correctly as but / ter, but they also can easily pronounce and spell other phonic-related words such as mutter, gutter, splutter, flutter, shutter, stutter, and so on. Again, knowing about ‘butter’, they can “lift the bar” and rise to another level by applying the 4S Middle Exchanging Techniques and Skills Transfer and change butter to batter or bitter or better. Having mastered this simple word creation skill, other related words can then be “created” using Frontal Exchanging, for example batter > matter > scatter > shatter. Likewise, bitter > fitter > litter and better > letter and so on. Hundreds of English words have double consonants and knowing this rule is one of the keys to pronunciation and spelling proficiency. Understanding just one word can enable a learner to transfer that knowledge to dozens of other words using the 4S accelerated learning methodology, when the rules of English are known. Consider the clue word, ‘arrow’. When one can correctly pronounce and spell this word, it is an easy step to pronounce and spell: barrow, harrow, marrow, narrow and sparrow. Something to ponder on: why are the words ‘hid’ and ‘hide’, ‘cut’ and ‘cute’, and ‘tap’ and ‘tape’ pronounced differently? DESPITE the billions of dollars expended by governments, international agencies and philanthropic benefactors in support of aid-related programmes annually, hundreds of millions of people across the globe are eking out lives reeked with poverty, disease and despair. The causes are myriad, but the overall outcome is the same – sheer misery and hopelessness. While the individual consequences vary in their impact and intensity, there is one common, universal problem, that, if addressed nationally and internationally, could at least partly alleviate many of the other issues. That common problem is illiteracy. There are almost 900mil illiterate adults in the world. Nearly 600mil are believed to be women. The evidence is irrefutable that in the 21st century, illiteracy has reached “epidemic” proportions globally. Added to this frightening situation is the fact that illiteracy is a major contributor, not just to poverty and unemployment, but also to child labour, trafficking in women and children, infant mortality, the spread of diseases such as HIV/Aids and the deprivation of basic human rights. Every nation, regardless of its economic status, has an illiteracy problem — one that ranges from being a major social issue to a plague-like situation that, year by year, remains neither contained nor abated. While the task of alleviating global illiteracy appears insurmountable, there is today a solution that other generations have not had. In this new millennium, English has become the “international” language. It is now the most globally used language medium in commerce, trade, industry, employment, communications, media, politics, tourism, education, law, and international relations. Today, the English language is a ‘passport’ to employment nationally and internationally. It is the magnet that attracts foreign investment into developing countries and is often the local job-creator in factories, on construction sites, in information technology (IT) centres, tourist resorts and hotels. As the “new” global language, English has the capacity to be a major, if not the most crucial weapon the world has ever had to break the poverty chains that bind millions. However, the prerequisite is that the methodology used to impart these vital language skills be appropriate to the needs of the new millennium, and not the failed methods that have resulted in millions of casualties in education systems globally over the last six decades. As director of the International Language Academy (ILA), I have travelled to many parts of the world, particularly across the South Pacific region. I have also travelled throughout South-East Asia, and to far-off places like inner Mongolia, and even to hard-to-reach areas such as the Pacific island nation of Nauru. My personal objective has been to train teachers, tutors, trainers – and sometimes, parents – to effectively use the accelerated English learning methodology I created called the 4S Approach To Literacy And Language that is now used in minor and major ways in 26 countries. The 4S stands for Symbols, Sounds, Sight and Self. They are the four main components or elements in a majority of language programmes. Its methodology is a “bridge” between the traditional phonic systems and the Whole-Word – Look and Say methods. Repeatedly, I have seen the lives of individuals totally changed through the acquisition of English language skills in just a matter of months. I have witnessed what proficiency in the language can achieve. Those who work at the coal-face of poverty know the truth of my assertion. In places like the squalid Kibera slum in Kenya, in the Karen refugee camps on the Thailand border, in the no-go areas of Dhaka in Bangladesh, there is one key that can open the door to a new life. That is the ability to speak English well. While it is important for every nation to retain its national language identity, decision makers are realising that in this modern world, a nation’s long-term economic strength depends not just on its natural resources or its industrial might, but on the English literacy level of its people. Why? Because the literacy level of the people rates as a crucial measure of a country’s human capital. Combating illiteracy therefore is not just a social and educational imperative, it is also an economic must. Over the next three months, thanks to the vision and initiative of The Star, I shall be presenting to the people of Malaysia proven techniques and tools that will quickly lift the bar in their personal English language skills. I would encourage teachers, tutors, trainers, and parents — in fact, all who appreciate the importance of English as this nation’s second language — to personally master the language skills tools provided in the next few weeks. This group of people shall then pass on the skills to their students, their friends and their family, and thus play their part in making Malaysia a prominent “secondary” English speaking country. by Keith W. Wright, the author and creator of the 4S Approach To Literacy and Language (4S) — a modern, innovative and proven method of accelerating the learning of English. The 4S methodology and the associated Accelerated English Program (AEP) are now being used internationally to enhance the English language proficiency of people from a diverse range of cultures and with different competency levels. As the head of the Australian International Language Academy and sole proprietor of Outreach Publications Pty. Ltd., he has authored more than 30 publications and developed and created 16 literacy, language, and grammar related courses. contact@4Sliteracy.com.au for your free copy of the 4S chart, The 26 Symbols Of The English Alphabet. IT may have been just two days away from the school holidays, but around 530 Form Four students were still all ears when it came to getting tips for the SPM Physics and Additional Mathematics papers they would be sitting for next year. The first tip they got from workshop facilitator and The Star columnist Sunny Yee was to stop thinking that they still have one year left to prepare for the SPM exam. “I’d advise that instead of looking at the year as having 365 days left (before your exam), look at the festivals. “Next year, you have Chinese New Year, then Hari Raya and then Deepavali will be your exam time already,” he told the students. “If you look at it that way, the three festivals actually pass very fast,” he said. Yee, who has around 25 years of experience teaching both subjects, also told them that in order to score a distinction, they must build up both accuracy and speed in answering the exam questions. “For example, in log or Archimedes’ Principle, it’s not just about knowing the formula, but which situation or question to apply it to,” he shared. For the Additional Mathematics paper, Yee advised the students to practice on 10 past-year questions a day. “Buy an exercise book to jot down all the topics that you always make mistakes in, so that you can do a quick revision of them before your exam,” he said. He also went through a few questions from the topics of function, quadratic functions and differentiation with the students, showing them common mistakes made by students and offering tips on how to answer the questions. For Physics, Yee pointed out that the exam questions generally test three areas: knowledge, understanding and application. He shared that questions testing knowledge were those that only require memorisation to answer. “I believe a lot of students are very good in this. They know the answer, but do they understand it?” he asked the participants. In order to score well in the paper, students need to be able to tackle the questions testing their understanding and application of the subject, he said. And according to Yee, this is best accomplished by doing past-year questions. “For preparation, do at least the past 20 years of SPM Physics questions. “If you are exposed to 20 years of past year questions, you will know the type of questions that will come out,” he said. He also covered a few examples of SPM Physics questions involving the analysis and sketching of graphs, as well as the topic of force and motion. Said student Low May Yee: “I’m glad I came to this workshop. Now I have a better idea of how to organise my revision schedule for Add Maths and Physics. Many students were also seen crowding around the table selling Yee’s books on SPM Physics and Additional Mathematics after the workshop. Said student Mohd Danial Mohd Jasin: “I found Mr Yee’s talk quite informative, and his way of explaining how to tackle the questions helpful. From time to time you will be required to memorize lines for a play, a speech, or a skit of some kind. For some students this will come easily, but others may experience anxiety at the thought of memorizing lines. The first task is to separate out any anxiety about speaking in front of others and deal with that apart from the actual memorization process. Realize that memorizing is one source of concern, and speaking to a group is another. Focus on one issue at a time. The best single advice for memorizing anything is to study in a way that appeals to as many senses as you can. By seeing, hearing, feeling, and even smelling your material, you reinforces it in your brain. There are several ways to reinforce information through your senses. Your best bet is to combine three of these techniques. You’ll find some technique s are appropriate for your assignment and others are not. Visual prompts act as a great tool for reinforcing information and committing them to memory. Use flash cards. Put all your prompts on one side and your lines on the other. Draw a series of pictures that represent your speech or your lines. Be very creative and think of a picture story to go with your lines. After you’ve created your picture story, go back and say your lines as you look at the pictures. Say your lines in front of a mirror and move your face or your arms a special way to emphasize specific words or passages. If your lines come in the form of a script, cover other actors’ lines with strips of sticky note. This makes your own lines stand out on the page. Read them over several times. Visualize other actors’ faces saying your cues. Feelings can be internal (emotional) or external (tactile). Either type of experience will reinforce your information . Write out your lines. The act of writing the words provides very strong reinforcement. Carry your script or speech with you at all times and read the full text when you get a chance to get a strong emotional “feel” for it. Get to know your character. Understand why you say and do what you do. Act out your lines as you say them, even if this is an unemotional speech. You can exaggerate your words with dramatic gestures. Try memorizing backward, from end to start. This separates the emotion from the words. Then read the text from start to finish, with feeling. This technique reinforces the emotional aspect. Learn to think like your character (get a feel for him or her). This can save you if you forget your lines on stage. Simply think like the character and say what he would say as close to the real lines as possible. Sound is a very effective tool for memorization. There are a few different ways to incorporate sound into your memorization skills. Read the script and record the lines of the other performers and leave the microphone off as you read your own lines. This leaves blank air space for your lines. Go back and practice saying your own lines at the appropriate times. Record your lines with exaggerated vocal expressions. You may even want to yell your words. Exaggerations leave big imprints in your brain. Record the entire play or performance during a rehearsal. Carry your recorder with you and listen to it as often as you can. You are currently browsing the www.Teo-Education.Com blog archives for November, 2009.